There's always cause to be excited when Alaine Allison Walls and John Gordon are involved in a project. They've blown me away with the 'dirty funk rock and roll' of Pablo Eskimo and have kept us all entertained and enthralled with the positive rock and roll vibes and upbeat blues of the ever-expanding Well Happy Band. But I was yet to see them in their incarnation as the Reverse Cowgirls, providing their classic bass and drum combo alongside seasoned musician Hugh Mclachlan, cutting a cool figure as frontman that put me in mind of Tim Armstrong or Joe Strummer, (Hugh also fronts the legendary Bucky Rage) and fantastically skilled guitarist Stephen 'Caff' Cafferty tops off a well-rounded conglomeration of talented individuals. CTH – With that out the way, what kind of themes do your songs revisit, what do you write about? CTH – Just letting it all out through the music? CTH – Yeah they were brilliant but you were still a hard act to follow. Would you describe your music as psychedelic? CTH – Espouse the notion that you can get a lot higher without drugs than with them, as in with meditation? CTH – Would you ever describe your music as dark? ALAINE – Have you heard Tombstone? KEMOSABE – I love you cunts! I love every time you play! CTH – Who were your highlights? ALAINE - King Khan, oh my god, we supported King Khan! CTH - Thankyou very much Reverse Cowgirls! Gonzo Division and Kemosabe signing off! 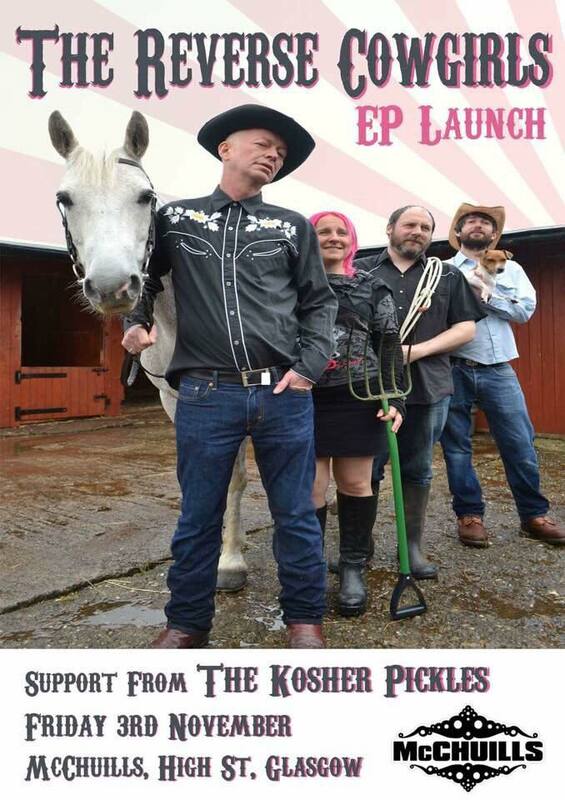 And be sure to catch them live wherever you can, as in at their EP launch on the 3rd November at McChuill's, with support from The Kosher Pickles! And I'll seeya' in the pit with Kemosabe!! !